I took my seat in City Winery, a guest at the Wine and Cheese 101 class, and sniffed. Ugh, I thought, who doesn’t wash their feet before going out in public. It took me a few moments to realize that oh wait, that stink of feet is the cheese. I DIDN’T GROW UP knowing and appreciating stinky cheeses. I completely believed that Velveeta, that neon orange block of salty cheese product, was actually cheese, and not a bad one at that. And then I went to England to study abroad. I marveled at the supermarket at the double Gloucester and Shropshire Blue. At Christmas, the mother of the friend I stayed with served cranberries and brie and tomato with fresh mozzarella, and I nearly kissed her full on the mouth. My wine is similarly limited: red or white, that’s my comfort zone. In a store, I choose it by whether I like the label, and in restaurants, I order the ones I can pronounce. And I pretend that when I order a cheese with a French name, I know before it shows up on my plate whether it will be soft or hard, crumbly or smooth. But secretly, I wanted to know what it means to swirl a wine. I wanted to know what cheese goes with what wine. I wanted to be in the club. Wine and cheese. Photo: amandabhslater. It isn’t just for “cork dorks” and “curd nerds” (names my teachers, Beth from Murray’s Cheese and Matthew from City Winery, gave themselves); taking the time to appreciate the tastes, textures, and combinations of wine and cheese is something for everyone. All it really takes is slowing down, but here are some tips to appreciating wine, cheese, and how to put them together. Step 2: Swirl, swirl, and swirl again. You want to swirl with enough oomph to really get the wine going, but not enough to slosh it out of the glass. The swirl comes from the wrist and the forearm. Don’t just use your fingers. If you think about it too hard, as I do, you’ll end up just swishing it back and forth. This will get the job done, but it won’t be smooth and sophisticated. Swirl with the base of the glass on the table, or just don’t overthink it and swirl. 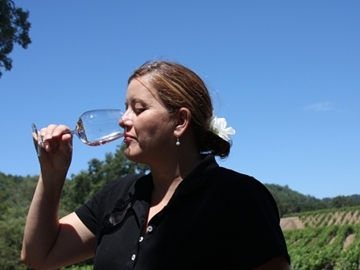 The reason for the swirling is to expose more of the wine to oxygen, opening up the wine and giving it more of a scent. Before swirling, if you can smell a wine without sticking your nose in the glass, it’s likely an old world wine (from Europe). If you can smell it from above the glass, it’s a new world wine (not Europe). Though you may want to try this for the first time among friends. Announcing with complete and pompous certainty, this must be a New World wine, and getting it wrong in front of oenophiles could be embarrassing. Step 3: After swirling, stick your nose right in there for a big sniff. Then name the first fruit or spice that comes to mind (don’t say grape). Grass, lemon, vanilla, these can all be right answers. Sniff the wine. Photo: philosophygeek. Step 4: Taste. But don’t swallow, slurp it through your teeth, loudly and with pride. This helps you perceive more flavors as the slurping allows the wine smells to go through the nostrils, so you’re smelling while you’re tasting. How does it taste? Does the taste of the wine match the scent of it? If you get into it, the specifics of the tastes (and smells) can be detailed. It smells like a peach, a fresh peach, a few days from being fully ripe, a fully ripe peach, and a peach a day past its ripeness are all options. As you swallow the wine, feel how the wine goes down your throat. Is it viscous? Does it cling to the back edges of your tongue? Or does it go down smoothly? What’s the aftertaste? Does it linger, or does it disappear? Because red wines usually linger, if you’re tasting multiple wines, start with white and move to red. The happiest bit of information that I left with is that the expensive wines aren’t necessarily the best. You can get a $10 bottle and still get a great wine. Every type of wine comes around every year. The steps to a cheese tasting are simpler and a bit more straightforward, but they involve the same basic idea: appreciate the smell and texture, smell, then taste. For hard cheeses, break off a piece. See how it breaks; does it break along natural lines? My thought of this stinks like foot is apparently an OK description for cheese. Footy, barnyardy, earthy, “James Brown funky,” these are all adjectives used by turophiles. An easy way to know if the cheese will have an animalistic “aroma” to it is if it has an orange rind. Other options include nutty, though this description is apparently overused, buttery, cakey, sweet, and meaty. Whatever comes to mind (other than cheese) is usually right. Cheeses are unique based upon their milk source and their aging process, some are made from the same herd of cows that grazes on very specific pastures. 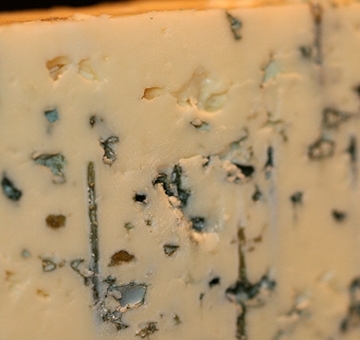 It’s not just the taste of a cheese that you should consider; texture is also important. Heavy, creamy cheeses love bubbly wines. Sweet wine and sweet cheese can complement each other and enhance flavors, but sweet and savory is also a good combination. A good pairing can be elusive, that third taste formed only by bringing the wine and cheese together, but trying out different combinations and seeing what you like is just as good. To combine wine and cheese, take a sip of the wine, take a bit of the cheese, then while some of the cheese is still in your mouth, take another sip of wine. 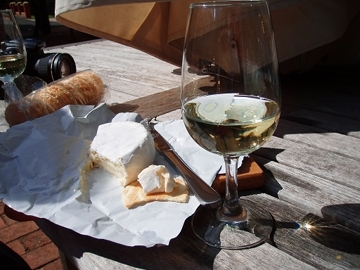 If you want to focus on the wine and cheese, do so on an empty stomach, with only bread and water on the side. If you want to throw a wine and cheese tasting event, according to Beth, you need about 1 ounce of cheese per person, a variety of soft and hard varieties, and between 3 and 5 cheeses is enough for people to try new things, but not enough to overwhelm them. For the wine, about ½ a bottle a person should be good. Or ask your guests to each bring a cheese and a wine. For a wine that goes with a lot of cheese, or foods in general, go for tempranillo. If you’re traveling, ordering the house wine is almost always a good option. It’s likely cheaper, and as Matthew pointed out, the house wine is made for the locals, and locals are going to demand the best. If it grows together, it goes together. If you can get a locally made wine and a locally made cheese, the two are likely to go well together. Or go for pairing a sheep’s milk cheese and a red. The pairing is likely to be a good one. It may not be perfect, but it’ll be yummy. And he’s right. It doesn’t matter if someone “in the know” thinks a certain combination is the best, it’s whatever you like. And I’m starting to think that stinky cheeses and I are going to get to know each other a little better. As long as I have a glass of wine at hand as well. Go straight to the source by visiting wineries in Argentina: Escape to Argentina Wine Country or if you’re feeling industrious, we have Green Recipes: How to Make Your Own Cheese.